The main purpose of face augmentation by implant is to add volume to the hollow parts of the face, usually on cheeks, forehead, and chin. In order to achieve three-dimensional face contour, the reduction and augmentation surgery should be well-combined for well-balanced face with the best facial ratio of the individual. Forehead augmentation by implant surgery uses custom-made implants to match individual’s needs to perform forehead augmentation to enhance the three-dimensionality of the face. 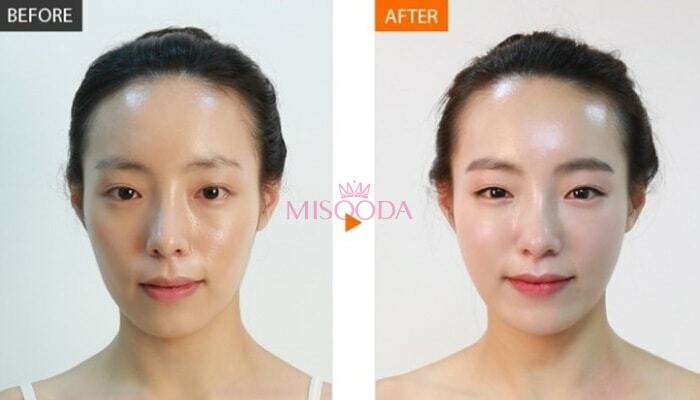 This procedure is appropriate for those who have very flat forehead, so they want to have 3-dimentional volume on their face by plumping up their hollowed forehead. • Precaution: 7days to fabricate the customized implant. Patients need to visit the clinic 1 week in advance from the surgery day for molding. This method is used in cases where the severity of short chin is not severe. Artificial implant, Goretex or Silicon, is inserted at the end of the chin to enlarge or lengthen the chin. This procedure is appropriate for those who have a short or receded chin. The side cheek bones may appear relatively protruded and the eye area appears sunken when the frontal zygoma area under the eyes lack volume and is flat with the cheek bones appearing wide. In this case, a harmonious and three-dimensional face shape can be created with front zygoma implant. General price guide line for Face Augmentation Surgery in Korea is USD$2,500 to USD$4,800 according to Korea Health Industry Development Institute. The price is decided in variable range depending on the method and difficulty of patients’ case.